The chapter itself is remarkably simple, it consists of only one scene: Magneto infiltrates Genosha's concentration camp, a horrifying institution rebuilt by the Red Skull and his cronies. It's a credit to writer Cullen Bunn for staying on top of Marvel's current events. Genosha's conversion into Hell was only revealed in the most recent issue of Uncanny Avengers. Good on him. Erik has plenty of god-awful memories of such a place, which haunt him as he makes his way to its mastermind. Ages ago, Erik was a young mutant who could barely lift a single screw— certainly not enough to extricate himself as a child. As an adult with severely limited powers (thanks to being blasted by the Phoenix Five), he's barely in a better position. It's a credit to Gabriel Hernandez Walta and Jordie Bellaire, their work here illustrating Geno-shcwitz is every bit as bleak as they intend. Likewise, the Red Skull is not simply the villain, he's depicted as the boogie man— seen only from a distance at first. The sad truth is, the Red Skull's S-Men would be no match for Magneto at the height of his powers. They're not unstoppable; they could barely hold their own against the Uncanny Avengers. Problem is, he's not at the height of his powers. It's difficult, staging a former villain as the protagonist. Especially a villain who has justified revenge headed his way. Mzee, the avatar of an African turtle god, hid in fear as a child when Magneto and his men slaughtered his village. Magneto deserves his come-uppance here. That's a difficult line to skate. There's also something a bit clunky about the dialogue, until you remember that it's supervillain pitted against supervillain. This is how they talk. It's melodramatic, it's grandiose. It fits. So. 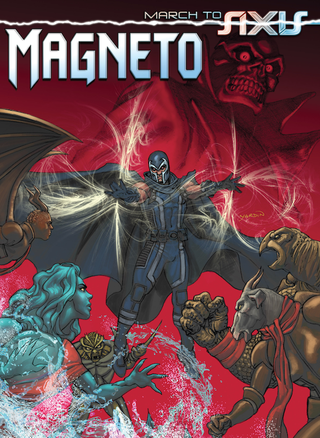 The issue ends with the S-Men ganging up on Magneto, beating him into submission. The Red Skull doesn't even bother to stick around to watch. That's a hell of a low point. IMO it's unlikely that this is part of a larger, Trojan Horse scheme. Magneto doesn't typically incorporate failure into his designs. Still, it's possible. Casey Jones is the author of All Fall Down, and a voiceover artist. You can check out his work here.